Last Friday the OP visited a remarkable show at the Lion and Unicorn Theatre in Gaisford Street London NW5. It was a one man show by Jonathan Douglas, MBE a veteran actor and radio journalist, best known as a radio host in Hong Kong. 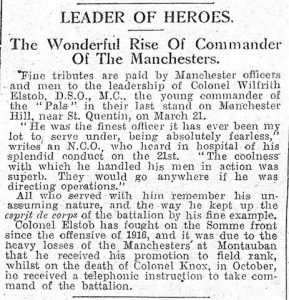 This was a series of monologues exploring the last 24 hours of life of Lieutenant Colonel Wilfreth Elstob VC, DSO MC who died, aged 29, in the heroic defence of Manchester Hill on 21st March 1918. 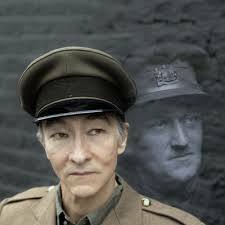 It was great to see a play written about a real soldier from the First World War who wasn’t a war poet. Elstob himself was an interesting man, whose character, motivation and deeds offers a different view of the men who fought and died in the Great War. Why Elstob? 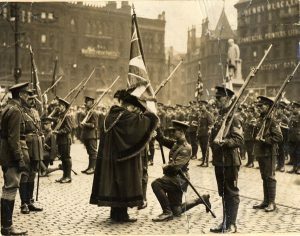 The 16th Manchesters were one of dozens of battalions that faced the onslaught of the German kaiserschlacht, the action for which “Journey’s End” is a theatrical prologue. Elstob was one of ten men awarded the Victoria Cross for actions on the 21st March, and one of some four hundred and fifty recipients of that award on the western Front. ‘Wilfreth Elstob joined the Manchester Regiment as a private soldier in 1914; ‘a burly former schoolmaster.’ He was quickly commission into the 16th battalion (1st City Pals) and a captain and acting company commander on their successful assault on the first day of the Somme. 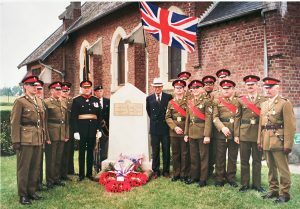 1st of July when the battalion stormed the German lines at Montauban. In October 1916 he took comm and of the battalion. He commanded his battalion through the 1917 battles at Arras and Passcendaele, and temporarily a whole brigade Elstob was a gallant popular, efficient and effective commander. His comrades cared enough about his posthumous reputation to collect the information and lobby for him to be awarded the Victoria Cross after the war ended. 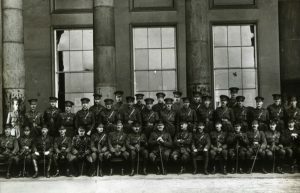 Officers of the 16th Manchester Regiment 1914 – Elstob was the last to survive. Its a brave attempt to get inside the mind of a hero and charismativc leader. Jonathan Douglas’ interpretation of Elstob’s mind is thought provoking. Douglas had done a good job of researching the details of his subject’s service. References to places such as Montauban and Trones Wood reflect diligent research, beyond the expectations of typical Camden Fringe goers. The dialogue reflects the known comments about Elstob’s character. Sure, Douglas is not Au fait with the details of military life. It was “stand to” rather than “reveille” in the trenches themselves and a singing competition is more plausible in camp than in the quarry. However, the result is a characterization of a complex character, a far cry from the caricature often portrayed. This is more ambitious than another version of RC Sherrif’s Stanhope. 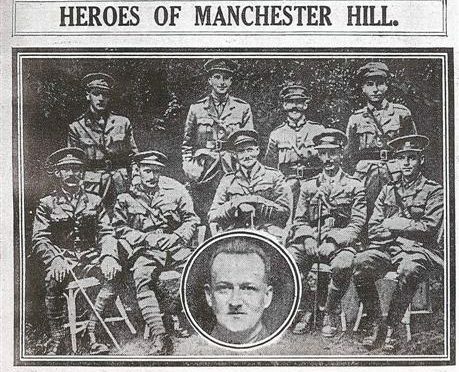 Douglas had gone well beyond the call of duty and made a reconnaissance of the quarry on Manchester Hill. He bypassed the metal gates to break in across the barbed wire and worked his way through the tangled undergrowth to take a picture of the site where Elstob and his comrades may still lie. I could not find a review or a website, but if anyone wants to contact Jonathan Douglas, the OP has contact details.